Saturday, 18 August 2018, 1:46p.m. 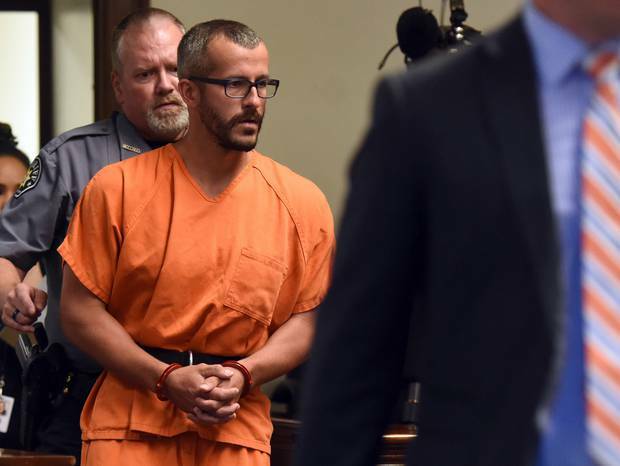 Hours before allegedly confessing to the murders of his missing pregnant wife and their two young daughters, Chris Watts gave a series of chilling TV interviews pleading for the trio's safe return. There were no tears as the 33-year-old calmly recounted the last time he had laid eyes on his young family, his arms tightly folded as he shifted from one foot to the other. "Last night, I had every light in the house on. I was hoping that I would just get ran over by the kids running in the door, just barrel-rushing me, but it didn't happen," he told Colorado TV station KMGH. In another interview, Mr Watts looked directly into the lens of a Denver 7 camera and said: "I have no idea, like, where they went. I don't even feel like this is real right now. It's like a nightmare I can't wake up from". To the untrained eye, Watts may have given the impression of a quietly anxious husband and father seemingly clueless about the whereabouts of Shanann, 34, Bella, 4, and Celeste, 3. But to renowned body language specialist Judi James, the subtle quirks in his physical behaviour told a different story to the one coming out of his mouth. Ms James has identified nine techniques that Mr Watts may have used to conceal his guilt as he was filmed on the front porch of the family's home in Frederick, Colorado on Tuesday. She says Mr Watts may have gone to extraordinary lengths to appear calm and unruffled in the belief that was how innocent people behaved. "Body language is not a precise science and using it in legal cases like this one can be especially difficult as lying signals can depend primarily on guilt-based responses," Ms James told The Sun. "This means an honest person lying about a very minor misdemeanour can easily look more guilty than a murderer who might be incapable of feelings of guilt or who even believes their actions were justified." The best lies have an element of truth to them and Ms James says Mr Watts "clearly sticks to the true events of his story" in a bid to come across as more convincing. According to police, a family friend reported Shanann — who was 15 weeks pregnant — and her daughters missing on Monday after the devoted mother missed a scheduled meeting. Mr Watts told reporters he returned home about 2am on Monday after a flight for a work trip was delayed. He said he'd had an "emotional conversation" with his wife before setting off for work a few hours later. But when she failed to return his calls and text messages as well as those from her friends, he became concerned. Mr Watts then recounted how he'd rushed home after a friend of his wife called to say she'd knocked on the door around midday and got no response — only to find an empty house. "The narrative here is about the friend calling him and how the house was empty when he got there," Ms James told The Sun. "These are likely to be events that he really did experience, so the verbal version and the non-verbal signals would be more likely to be congruent and it is often this that gives the impression of being cool and collected. "His arms are folded which would help avoid any gesticulation that might be incongruent to the verbal narrative." Ms James said although recounting the truthful parts of his story helped Mr Watts create a "poker face", his underlying emotions emerged in other ways, for example, via a "side-to-side swaying of his body" and a "shaking of the head as he talks". "The head shake will look like a 'no' gesture but it can also be used to register disbelief," Ms James said. "His eyes move to his right as he relates his story before coming back to perform sustained bouts of quite level eye contact. The sideways glance can suggest someone is accessing creative thinking but this trait isn't true of everyone. "Eye contact is often seen as a signal of truthfulness but it is often acted quite effectively by people who are guilty too. "His blink rate isn't accelerated to a point where you might suspect anxiety or fear but his breathing does sound a little shallow, which can happen under pressure." Mr Watts was refused bail during a brief appearance in court earlier today following his arrest on suspicion of triple murder. He allegedly confessed to the crimes before leading investigators to a property owned by his former employer Anadarko Petroleum — one of the state's largest oil and gas drillers — where the bodies of Shanann, Bella and Celeste were found. Authorities have not offered a motive behind the murders, nor have they revealed how the victims died. They have until Monday to lay formal charges against Mr Watts. There has been speculation prosecutors are looking at the possibility of laying a fourth murder over death of Ms Watts' unborn child. "As horrible as this outcome is, our role now is to do everything we can to determine exactly what occurred," Colorado Bureau of Investigation chief John Camper told a news conference this morning. Shanann Watts' Facebook account paints a portrait of a happy married life and features dozens of photographs and videos of outings with her husband and children. She was passionate about her work in the health and wellbeing industry and beams in countless selfies with colleagues at weight loss workshops and in snaps with friends. The young mother appeared to be very much in love with her husband, singing his praises as a father and thanking him for being a supportive husband. "I love this man! He's my ROCK!" She wrote on May 5 alongside a collection of photographs of the pair smiling at a restaurant, on the beach, and relaxing at home. On June 19, she Facebooked a screenshot of a text message exchange with her husband in response to a sonogram of their unborn child. He replied that he loved the baby already. Ms Watts captioned the exchange: "I love Chris! He's the best dad us girls could ask for". Ms Watts also dedicated collages and slide shows to her husband, describing how their love was growing stronger by the day and explaining how the couple agreed to have a third child. Close friend Ashley Bell said she never noticed any animosity between the couple, describing Mr Watts as a loving father and husband. "I just don't understand it," Ms Bell said. "She was always about her girls. She would do anything for her girls." Another friend, Mandy Aikman, posted a tearful video to Facebook live in tribute to her friend of 10 years, who she says she met at a support group for those affected by auto-immune disease Lupus. Joe Beach, who lives next door to Ms Watts' parents in the town of Aberdeen, said she told him everything was fine at home. "We were talking about general things, about how her two girls were doing and how life was out in Colorado. She didn't give me an indication that there was anything wrong. She seemed pretty happy," Mr Beach told AP.